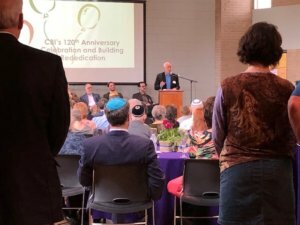 Bob reflects on the history of Congregation Beth Israel at Sunday’s ceremony for its 120th Anniversary and the opening of its recently renovated building. 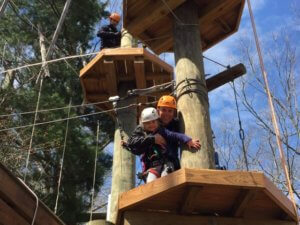 Please contact Bob directly if you’re interested in a guide for your next adventure. 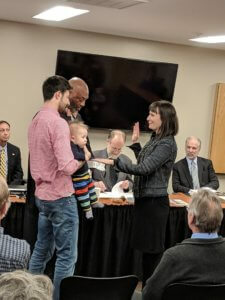 Attorney Elizabeth Newman was sworn in to serve on the Buncombe County Board of Elections on March 6, 2019. She will be joining fellow Board Members Jake Quinn, Linda Block, Stephen Duncan, and Jay Watson. 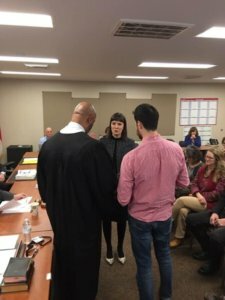 Adam and Benjamin Rosen (Elizabeth’s husband and son) accompanied her as she took her oath.